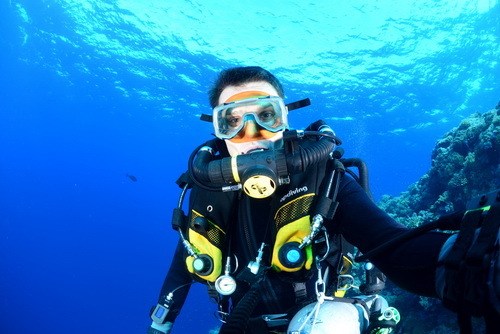 I'm Jaap Voets, born in 1972 and diving since 1999. In the first few years I only dived on holidays, but later on the virus caught me. I'm now a PADI Divemaster, DSAT Tec Deep Diver and IANTD CCR Mod3 diver. When I know there will be something nice to photograph I take my camera with me. I started out in 2002 with a sony F707 in an Ikelite Housing with a Ikelite DS-125 strobe. For that time this camera was a high-end consumer point-and-shoot with a beautiful zeiss lens. Although it was great at macro shots, it lacked a decent wide angle solution. So .... I added an Olympus C4000 to my kit, housed in a PT010 housing and complemented with an INON UWL-100 wide angle lens and dome port. This smal kit gave me very nice wide angle shots. Being used to SLR since I was a kid, the point and shoot camera's are nice, but the shutter-lag was a major drawback. So when minolta released the 5D digital SLR in 2005 I jumped in and bought one. Too bad no-one built an under water housing for it. Not so much later Sony took over the Minolta camera line and released the Alpha 100. When Ikelite announced a housing for the A100 I quickly made up my mind and sold my other gear to buy the A100 with the Ikelite housing. That kit has served me very well in those years, but sadly my housing flooded in october 2009. I was taking a test dive with a freshly arrived 30mm macro lens when the housing was full of water.